The Philadelphia Union are on one of their best stretches of soccer in franchise history. Winning on the road, beating league leaders at home with authority, and getting to another cup final without really breaking a sweat are how the Boys in Blue have spent their summer. More than just the winning, though, the team is playing with its own style: one of self-assured flow, one of confidence. Is it beautiful and fluid, like this? Is it physically imposing, like this? Is it irreverent, like this? Or is it fierce, fancy, and a bit fortunate, like this? After the Union went in genuine search of their 9th points in 8 days but found only 7, it’s worth exploring the team’s burgeoning confidence and its ripple affects. The word’s third definition is a feeling of self-assurance arising from one’s appreciation of one’s own abilities or qualities. The oft-maligned and (historically) mostly-mediocre Boys in Blue are suddenly among the darlings of Major League Soccer. Their free-flowing style has GIF-worthy moments almost every week, and not just from the team’s Brazilian winger (who is himself a walking, talking GIF-making machine). This is noteworthy because the Union have never been an overtly confident team, never a side that imposes itself upon others. Even in their winning years, of which there have been only two, the Union were a counterattacking squad of overmatched players. Because they lacked enough cohesion, talent, or je ne sais quoi, they were forced to pounce on other team’s mistakes instead of forcing the mistakes themselves. This latter can be a winning strategy, but it certainly isn’t an assertive one. In 2018, things have changed. The second definition of the word confidence is the state of feeling certain about the truth of something. 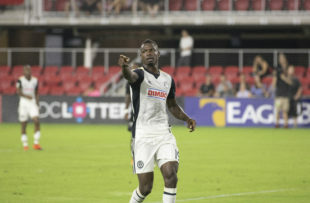 In 2018, the Philadelphia Union are a playoff team. With just 7 games left, they are closer to the 3rd seed in the East than missing the playoffs altogether, closer to the top of the conference than the bottom. Beyond their place in the standings, the Union are approaching games differently than they have in the past. On the road, the Union have won 4 of 6 and changed little about how they approach matches away than at home. In fact, over the weekend against a depleted and desperate Orlando City SC side, it was the hosts in a bunker and counter position and the visiting Union imposing their will and taking the game to their opponents. The Union were the aggressors over the weekend in someone else’s building. The primary definition of the word confidence is the feeling or belief that one can rely on someone or something; firm trust. For the Union organization and for its fans, this kind of certainty has never existed. From the scandals of the Nowak era to the inanity of Rais M’Bohli and Nick Sakiewicz, from the litany of swing-and-miss signings to the daily and seemingly unending injury sagas, through all of the other nonsense in between, there has been no place of solace for Union fans. Nothing firm, nothing to trust. Today, with two weeks to breathe before the team’s next match? A 10 point cushion is as firm as even the most optimistic fan might have imagined, and the team’s belief in one another and the manifestation of such on the field feels a lot like trust. Confidence is a feeling. To be confident is to be sure, to have faith, to know beyond reason or rhyme. The Union have confidence in themselves and it’s showing every week, in every match, from every player. This is a truth. More surprisingly, though, Union fans are beginning to become confident. The special Philadelphia brand of overarching malaise has given way to minor nit-picking amidst a cascade of praise, truly uncharted territory. Jim Curtin is right when he says that Union fans deserve a home playoff game. For the first time since 2011, Union fans are starting to believe he might bring one to them. Union have reached the tough part of becoming a good team. Getting hacked like crazy by inferior teams, but have not been good enough (or have enough star power) for the refs to protect them. Gotta force their way through this and hope for no serious injuries. I was and still am bitter about dropping those points. It would be very fitting for this club to get ice cold between now and the 15th. right? if they skip that cold stretch and continue til the end like they have been i’ll be ready to call them a good team but the past has left me weary of granting them anything before they’ve finished. Dropping points happens though. We looked much better than the other team in a game on the road, against a team that didn’t play a midweek game, where we were not protected by the ref, and lost our best player before half time. And lost a sub through injury just a few minutes after he came on which could have allowed for resting an additional set of tired legs. The Union have been fortunate of late with injuries. This is my worry. There are a few guys on the squad who are just not replaceable right now — Dockal, Bedoya, Burke — and if one of them goes down, the team might fall apart. That’s MLS for you though. Most teams have a couple of players that you just can’t replace. Just gotta hope one of the young guys can step up if needed.